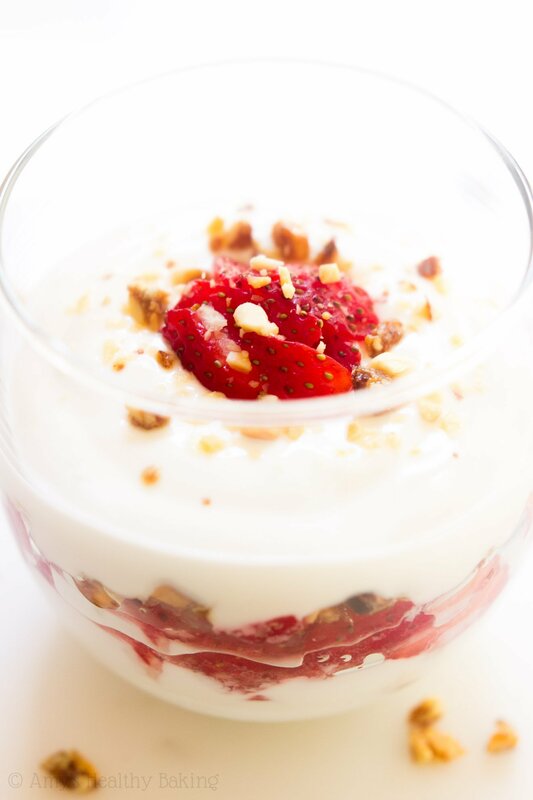 A quick & delicious recipe for Greek yogurt with layers of fresh fruit and mixed nuts. They’re a sweet, nutritious & protein-packed way to start the day! Today’s recipe is sponsored by Nature Valley. 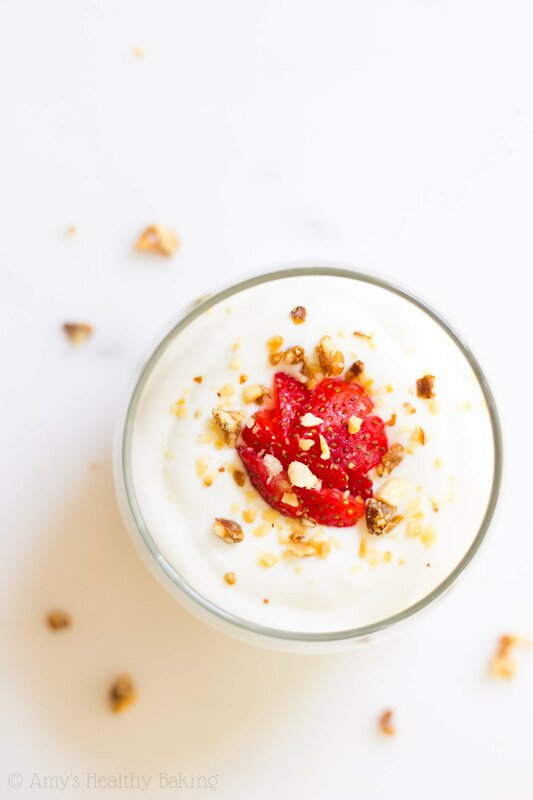 They make the gluten-free Roasted Peanut & Honey Simple Nut Bars that give these parfaits their irresistible crunch! During my sophomore year of college, I lived in a small apartment with three other girls, and due to the limited space, we each took one shelf in the pantry and half a shelf in the fridge for our food. Since that wasn’t conducive to stockpiling lots of snacks or fresh vegetables, and since we lived directly across the street from the grocery store, we usually walked over multiple times each week and only bought what we needed for the next few days. However, I tended to get a little overexcited in the dairy section, and I often brought home close to ten single-serving nonfat yogurt cups in various flavors. Anything from normal options like strawberry and blueberry to more interesting choices like pink grapefruit and pumpkin during the holidays. The girls laughed at first at my stacks of yogurt cups on my shelf, but… Eventually they started to do the same thing too! 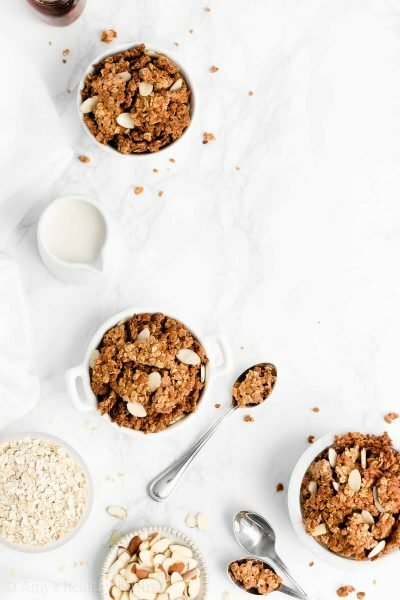 So during many mornings and lunches, two or three of us—whoever was home—would sit at the kitchen table, each with our own individual cup, and we’d pass around a box of granola to take turns shaking it over our yogurt. 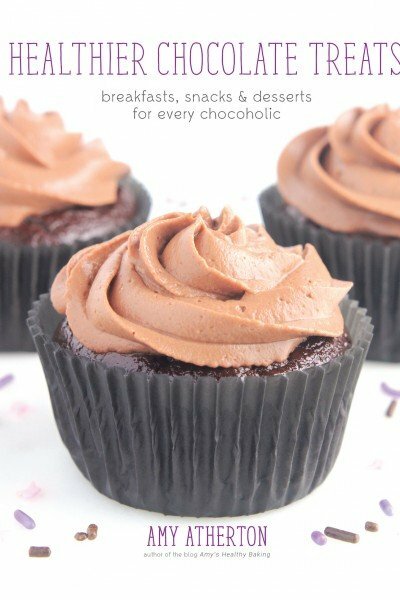 Sometimes we even added chocolate chips for an extra treat! 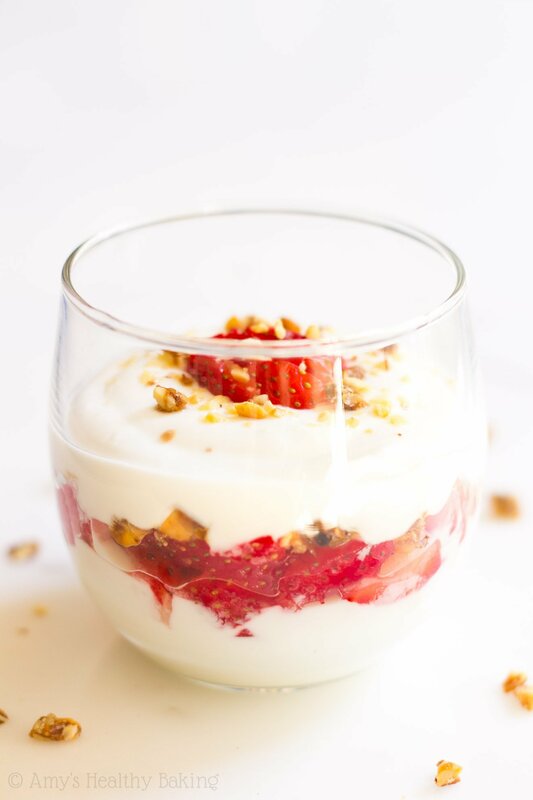 I still think of those college days of yogurt parfait parties around the kitchen table whenever I make one, but my parfaits look a little different now. 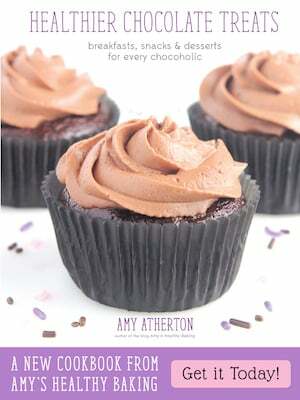 They contain a lot more protein, far less refined sugar, and fresh fruit instead of chocolate chips. 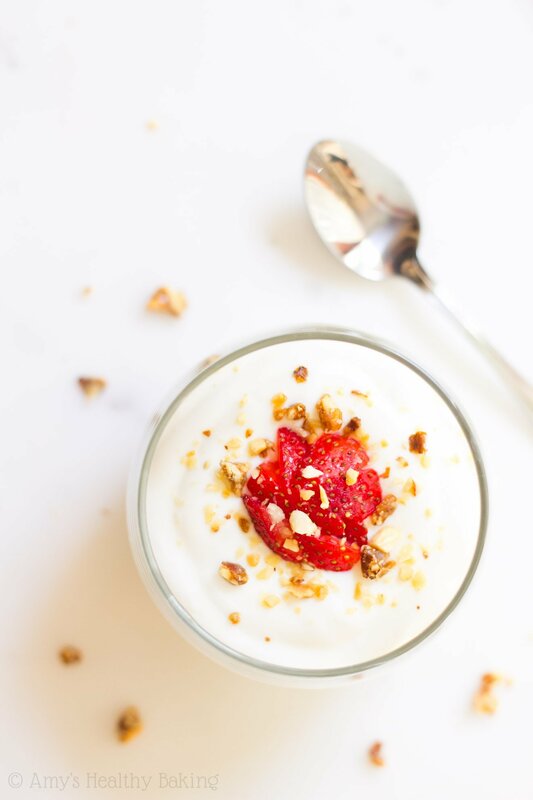 And currently, these Easy Fruit & Nut Yogurt Parfaits are my latest obsession! 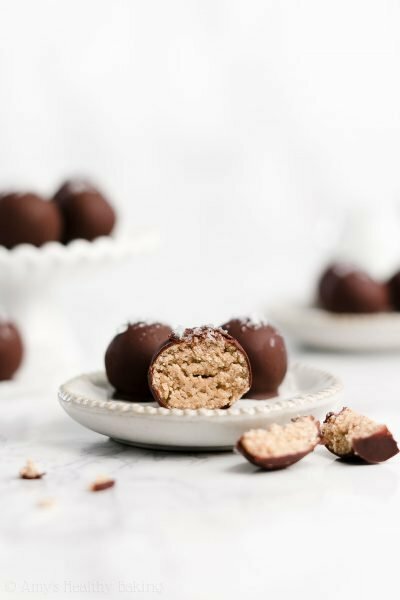 These wholesome breakfast treats start with Greek yogurt. If you’ve been around my blog for a while, you’ll know how much I love it! 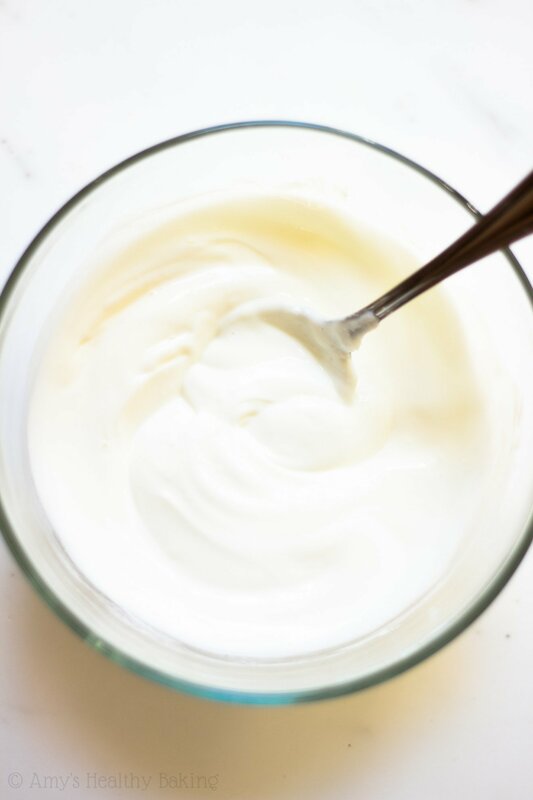 Greek yogurt is packed with over 20 grams of protein per cup, compared to just 8-10 grams in regular yogurt. That big protein boost is a great way to start the day! Next comes the fruit. I personally love fresh strawberries and could eat them every day, but just about anything will work. Go with whatever you find in the kitchen! Blueberries, raspberries, peaches, nectarines, bananas, cherries, pomegranates, even homemade apple pie filling… Or any fun combination. The sky’s the limit! 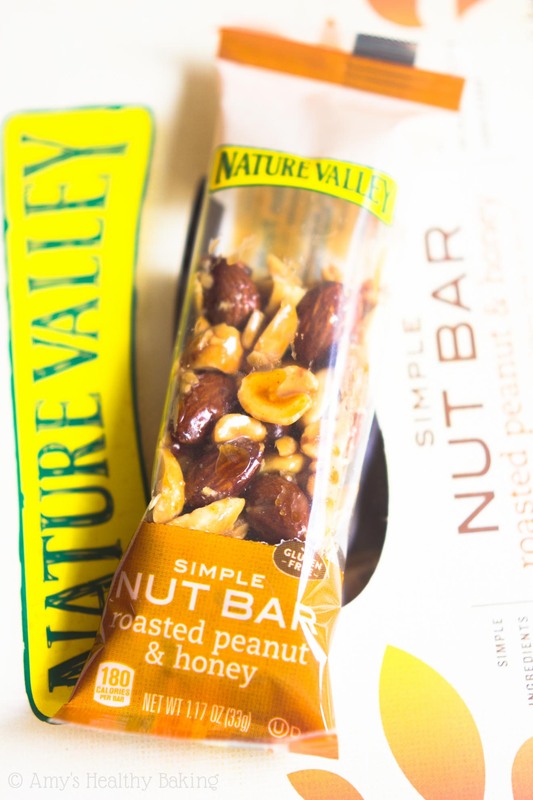 Finally, for a little crunch, you’ll add chopped mixed nuts in the form of these Nature Valley Roasted Peanut and Honey Simple Nut Bars. 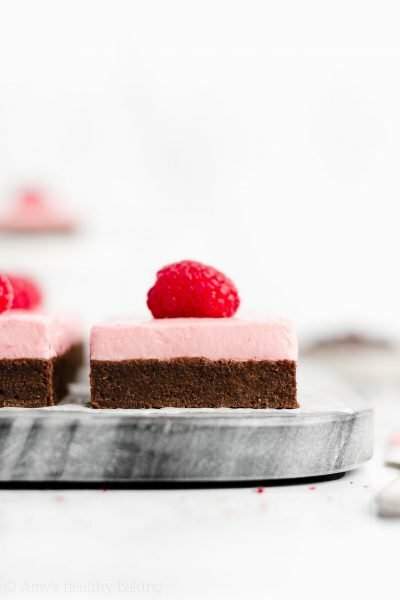 <LINK> I found them at my local Safeway grocery store, and they’re both gluten-free and clean eating friendly. 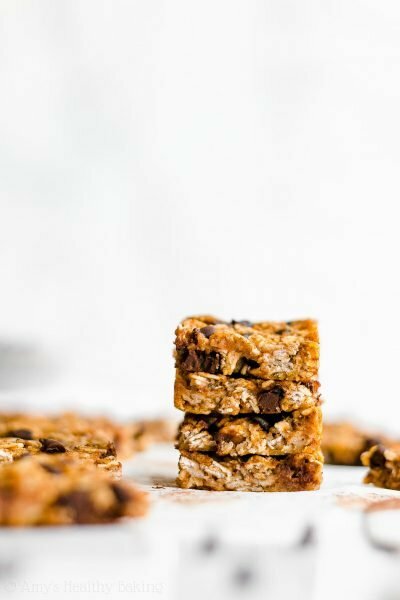 These bars contain just seven ingredients—that’s right, just seven!—including peanuts, almonds, and sunflower seeds. Yum! I have a little trick for superfast breakfasts throughout the week… I prep everything ahead of time! 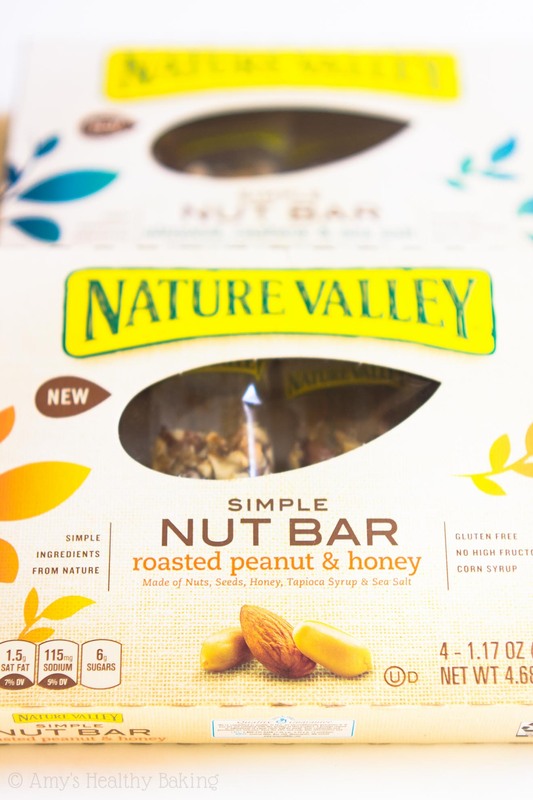 I leave the carton of yogurt and a Tupperware container of sliced fresh fruit in the fridge, and I chop up one of the Nature Valley Simple Nut Bars and put all of the pieces in a zip-topped bag in the pantry. Whenever I wake up and want my parfait, the assembly takes all of 60 seconds—and that means I get to sleep in a little later! Now this is my kind of “fast” food! Notes: Any sweetener may be substituted in place of the stevia. Any fresh fruit may be substituted in place of the strawberries. Here are some other ideas: blueberries, raspberries, cherries, bananas, peaches, nectarines, pomegranates, and homemade apple pie filling. Nature Valley has made 12 of your favorite snack bars gluten-free for even easier snacking! Visit their website to learn more, and enter the Nature Valley Perfect Pair Sweepstakes on Facebook and Instagram for your chance to win a $500 gift card! I eat and make yogurt parfaits like its nobodies business, they are the best snack ever! 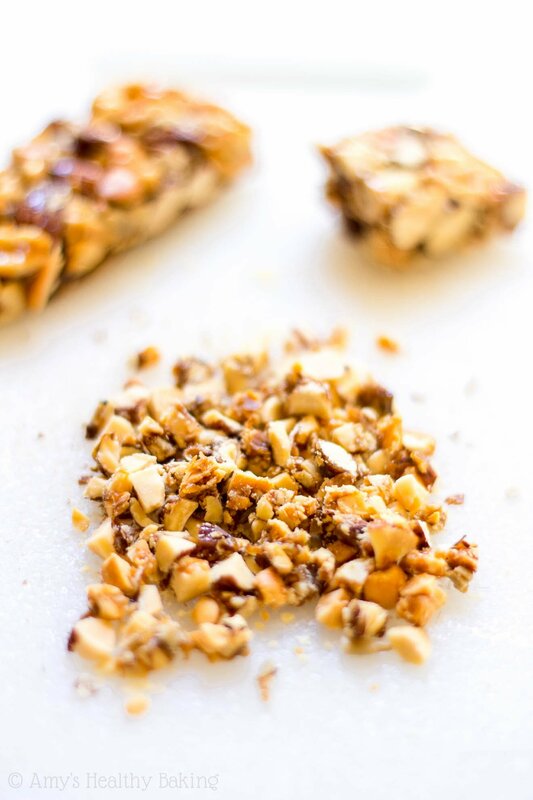 The roasted peanut bar is a great topping! So true Bethany — they really are the best! I love quick recipes like this! I think people forget how easy it can be to eat healthy… so simple, yet delicious.